The 2020 Jeep Gladiator release date is fast approaching, and we're excited to soon have this all-new Jeep truck for sale at St J Auto Chrysler Dodge Jeep Ram. We have the latest Jeep Gladiator news and updates, so make sure to stay in the loop by keeping in touch with our helpful Jeep sales team. Whether you're curious about the 2020 Jeep Gladiator towing capacity and performance features or the new Gladiator interior technologies, we'll be happy to answer all your questions. 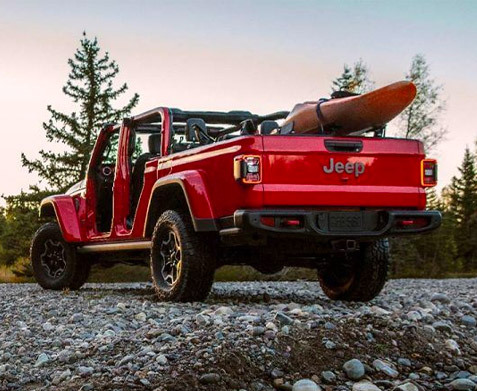 Ask about the 2020 Jeep Gladiator price and our 2020 Gladiator lease specials when you visit our Jeep dealership near Hanover, NH! When you get behind the wheel of the all-new 2020 Jeep Gladiator, the way you think about trucks will be forever changed. The 2020 Gladiator is the only open-air pickup truck in the industry, creating a driving experience like no other. As you traverse New Hampshire roadways, a high- and low-range 4x4 system and standard Dana® 44 front and rear axles will ensure you maintain total control. Meanwhile, an available Industry Exclusive forward-facing TrailCam Off-Road camera will help you take your off-roading adventures to the next level. Wondering about the new Jeep Gladiator towing capacity? The 2020 Jeep Gladiator is the ideal work truck thanks to a best-in-class towing capacity of 7,650 pounds and best-in-class max payload of 1,600 pounds. Find out more about the incredible 2020 Jeep Gladiator mpg ratings and performance features at our New England Jeep dealer! Jeep knows that customization is key when it comes to creating the perfect driving experience. 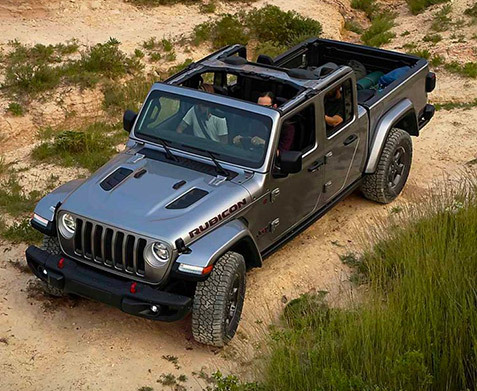 That's why you'll have the option to choose between Hardtop Jeep Gladiator and Soft Top Gladiator models. And because the new Gladiator features a three-position tailgate and available roll-up tonneau cover, loading up your pickup and storing cargo is fast and easy. 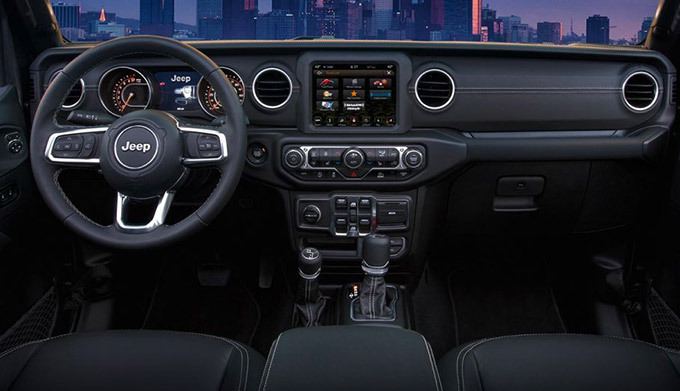 As you drive through Hanover and beyond, you'll enjoy every second spent within the 2020 Gladiator interior thanks to an advanced available 8.4-inch Uconnect® 4C NAV touchscreen infotainment system. Plus, an industry-exclusive removable Bluetooth® wireless speaker will provide the premium audio you deserve, while available Apple CarPlay™ and Android Auto™ capabilities allow you to queue up the perfect playlist for every journey through St. Johnsbury. Contact St J Auto Chrysler Dodge Jeep Ram to preorder a 2020 Jeep Gladiator and hear the latest news about the 2020 Gladiator release. 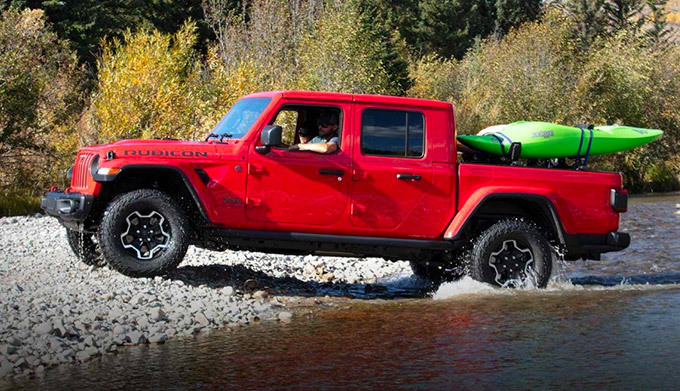 We'll let you know as soon as we have the new Jeep Gladiator for sale near Hanover, NH!